Want to supercharge your salad? Look no further, these top ingredients will provide a nutritional upgrade to your salad. Sure, leafy greens, tomatoes and other vegetables are healthy, but with these additions you can multiply both the nutritional value and flavor of your salad. Researchers consider it a “super-herb”. When compared with other common herbs it had 3 to 20 times higher antioxidant activity than the other herbs studied. In addition, it has anti-inflammatory and antibacterial properties. It also contains carvacrol, a phenol which can potentially be used to treat prostate cancer. 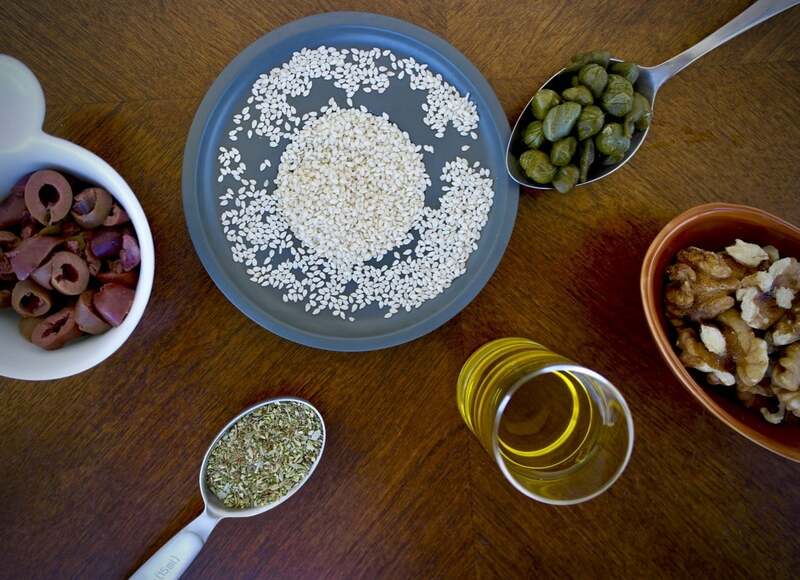 Use it: In Greek cuisine we use mainly dry oregano. You can add it to your dressing and then pour over the salad, or as is common with the traditional Greek salad, you sprinkle a bit of oregano directly on the salad right before serving. Everyone knows how nutritious walnuts are, not only because they are a good source of protein and good fats, they are also one of the few plant sources of omega-3 fatty acids, these fatty acids are known to reduce inflammation in the body protecting from various chronic diseases. Use it: I usually break the walnuts in smaller pieces with my hands (or you can chop them) and then I heat them in a small pan for a couple of minutes, I let them cool and add them to the salad or you can just throw them in raw. Olives, and I mean real olives not those tasteless black ones you get in cans that taste like nothing, can provide extra flavor to any salad. Olives are in fact rich not only in good fats but several antioxidants that have anti-inflammatory and antimicrobial qualities. However it is important to use the right ones. All olives go through some sort of processing to remove the bitter taste from the phenols (a type of antioxidant). Green Spanish style olives and black California style olives use lye, a sodium hydroxide solution, while Greek style olives use brine (water with salt) or when dry curing, just salt. 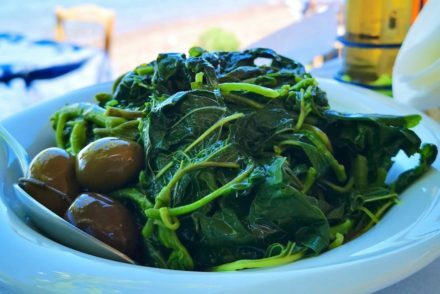 Flavor-wise there is a huge difference, but recent research also shows that the Greek style natural processing of olives results in a higher nutritional value as well. A study just published in the Journal of Agricultural and Food Chemistry compared Spanish, California and Greek olives and found that Greek style olives (processed naturally with brine) had higher levels of these phenolic compounds, while the California style olives had the lowest levels of most compounds measured. 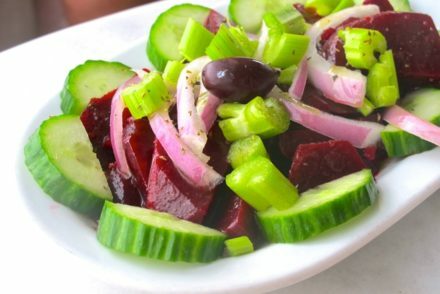 Use it: In Greek style salads whole kalamata olives are added and I often use other types as well that may be only cured with salt. 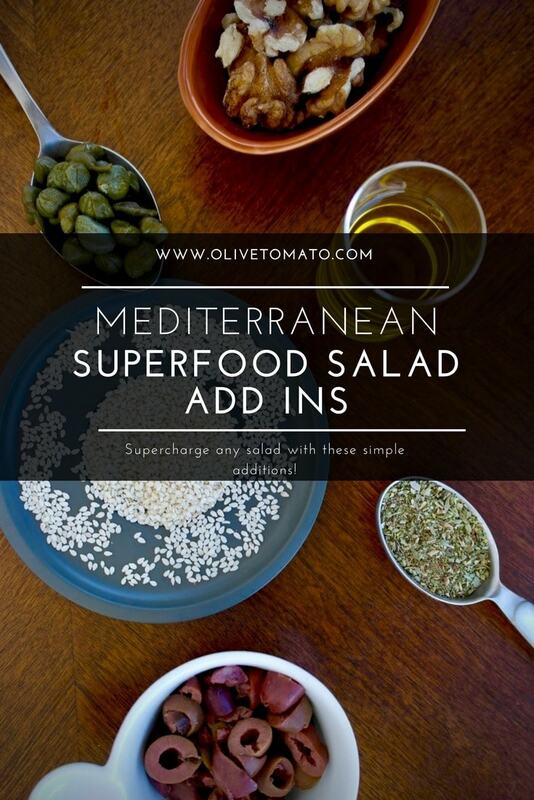 Sliced olives blend well in leafy salads. Just a few capers are enough to give a lot of flavor to a salad. And until recently nobody thought much of them nutrition-wise. Well, there are several promising studies that show that these little buds are a good source of several antioxidants that may be involved in protection of the liver and have anti-diabetic and antitumor activity. Another study had shown that just a small amount of capers may be able to prevent the formation of by-products from meat consumption that has been linked to cancer and heart disease. In other words make sure the salad you have when eating meat (you are having salad too right?) contains capers. 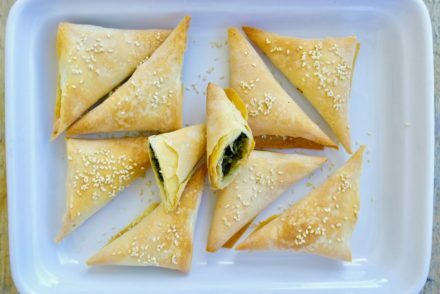 Use it: Capers go well in all salads, but especially in tomato salads and with feta cheese or other white soft cheeses. They also pair perfectly with olives. When adding olives and capers to a salad, I do not add salt otherwise and I rinse (and dry) the olives and the capers. We often only consume sesame seeds on bagels or in the form of tahini which we also consume mainly when consuming hummus. But sesame seeds on their own are a lovely addition to any salad. Apart from the flavor and texture they provide, sesame seeds are little nutrition gems. They are an excellent source of protein, vitamin E and a good source of iron, calcium and copper. They also contains lignans a group of substances that have antioxidant activity and appear to lower cholesterol levels in the blood, but also protect from cancer. And they are richest source of phytosterols of any nut. Phytosterols are compounds that can lower cholesterol levels, it is the same substance added to cholesterol lowering margarines. Use it: Sesame seeds can go in any salad but they pair especially well with cabbage salad, broccoli, carrots and cucumbers. I was debating whether to add extra virgin olive oil to this list, the reason being olive oil is a standard ingredient when it comes to salads in the Mediterranean diet. However, it is still common to make some sort of vinaigrette with other vegetable or seed oils. Please don’t. First of all none of these oils contain the antioxidants that olive oil has. In fact most of the benefits of olive oil ranging from heart health to brain health are due to the antioxidants, NOT the type of fat which is mainly monounsaturated. That is good too, but don’t assume that just because an oil is rich in monounsaturated fats it is the same as olive oil, it is not. Use it: Use the freshest olive oil you can find, if you make a salad dressing use it as soon as possible and do not store it for later as many of the protective substances are sensitive to water. For more tips on using olive oil click here.